Every second, our brains take feedback from the world and provide us with a sense of consciousness: awareness of what we are doing and what we have just done. How this process works in the brain is no simple matter. But sometimes examining how a process fails—as consciousness does in people afflicted with epilepsy—enlightens us to how it works. With recent advances in mapping the spread of epileptic seizures, we can now align the unique fractures in consciousness that occur during seizures with the interference that seizures cause in specific cerebral networks. Loss of ongoing memory, which disrupts the continuity of consciousness, occurs when seizures spread through the brain’s corticolimbic networks. The fractures in consciousness that occur in these limbic seizures suggest that one component of consciousness is provided by ongoing memory, which allows us to use the knowledge of the immediate past and anticipate the immediate future. This component of consciousness is necessary for the mind’s continuity in time. Volitional control of consciousness is disrupted in absence spells, in which a seizure spreads through frontothalamic circuits. The disruption of mental capacity in absence spells suggests that an integral component of consciousness is the voluntary control of intentions. This component is closely related to, but separable from, selective attention, in which some contents of consciousness are “spotlighted” while others fade to the background. The control of intentionality allows consciousness to coordinate mental resources and to provide the sense of one’s active role in personal experiences. A classic debate in brain research has been that between localization and mass action. The question is whether psychological functions, such as spatial memory and verbal reasoning, are localized in specific brain regions, or whether they emerge from the mass action of the brain as a whole. With modern evidence on localized brain activity, as seen by neuroimaging methods such as functional magnetic resonance imaging (fMRI) or dense-array electroencephalography (dEEG), it may seem that localization clearly has won out. Indeed, localized brain activity can be reliably demonstrated with many cognitive tasks. However, the best scientific understanding we have of how psychological function could arise from human neural networks has come from artificial neural- network models in computational neuroscience. These models illustrate principles of distributed-information representation that are very similar to the classical notion of mass action. A primary principle, sometimes called connectionism, is that information is represented in the patterns of connections between neurons, not in the neurons themselves. Connectionist simulations show brainlike properties that have never been possible to create with traditional artificial intelligence. One example is content-addressable memory. With a conventional computer, you must specify not only what is to be stored in memory but the “address” where it is to be placed. 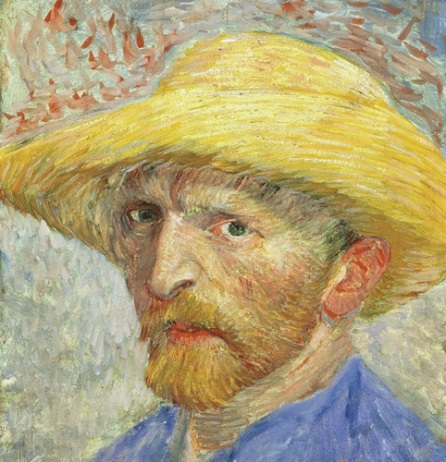 But when information is represented in the patterns of connections in a network, then simply presenting the network with the content (such as the pattern of a face to be recognized) causes it to address that memory as an intrinsic feature of the activation of the widespread distributed connections. Informed by principles of distributed computation, neuropsychological theorists have generated new concepts for relating complex qualities of the human mind to the specific properties of cerebral networks. For example, Giulio Tononi at the University of Wisconsin and Christoph Koch at the California Institute of Technology have drawn upon connectionist reasoning as they interpret evidence suggesting how consciousness might arise within the large-scale networks of the cerebral hemispheres. Although the study of anatomy shows that there are extensive neural connections within and between the cerebral hemispheres that could be active, Tononi and Koch theorize that consciousness emerges from the dynamic pattern of physiological connections that are active at any one point in time as an integrated assembly. The idea of memories stored in the patterns of connections among neurons was first formulated by Sigmund Freud in the 1890s. The issue was addressed by mathematical formulations of nerve-net cybernetics by Warren McCulloch and Walter Pitts at the University of Chicago in the 1940s. This issue remains important to modern neuroscience theories such as that proposed by Tononi and Koch. From the connectionist perspective, if we could understand the control of large-scale physiological assemblies in the brain, we could also understand the control systems necessary for regulating consciousness. All of this information leads back to epilepsy, because a dramatic clue to the sensitization and spread of physiological network assemblies may be found in the pathological phenomena of seizures. The ways that seizures engage certain networks and not others may show how dynamic ensembles of neurons can be formed within specific anatomical networks. The psychological deficits that are characteristic of these specific seizures may then provide clues to the normal separation of the functional components of consciousness. A first principle of neuropsychological function is basic enough that it is easily overlooked. The human brain’s psychological operations are organized in relation to its general architecture, which comprises a nested hierarchy of the evolved structures of the vertebrate brain. This hierarchy can be described as a vertical dimension of neural organization: More recently evolved structures are stacked on top of more primitive ones (see Figure 2). 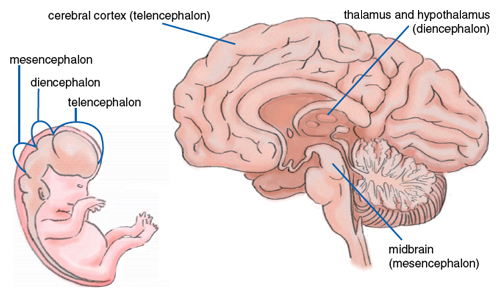 As seen most clearly in the still-forming brain of the human fetus, the cortex is dependent on the major circuitry of the subcortical telencephalon, including the limbic circuits and those of the basal ganglia. These telencephalic (end brain) systems are in turn dependent on regulatory influences from the thalamic and hypothalamic divisions of the diencephalon (interbrain), which sits on top of the brain stem and provides a gate for the traffic into and out of the telencephalon. The functions of the diencephalon are in turn dependent on ongoing support from the brain stem’s mesencephalic, metencephalic and myelencephalic levels of organization, regulating primitive but essential functions such as breathing, heartbeat and the brain’s level of arousal. Some people with epilepsy experience generalized tonic-clonic seizures, or convulsions. Convulsions are the most severe form of an epileptic seizure and tend to “generalize” or spread throughout the brain’s vertical organization. As they do, these seizures provide a clear demonstration of the brain’s vertically organized architecture, through which more recently evolved networks are embedded within the control mechanisms of more primitive networks. To the extent that multiple vertical levels of the brain’s control systems are involved in major changes in consciousness, such as in sleep and dreams, we can see that these nested control systems of the brain must be continually integrated to shape qualities of everyday experience. More specific clues are given by seizures that remain limited to specific circuits in the forebrain (the diencephalon and telencephalon). Seizures that do not spread are described as localization-related or partial seizures. If they impair consciousness, they are termed complex partial seizures. A common feature of these seizures is that they engage the limbic networks at the medial core of the cerebral hemisphere. The limbic networks are centered on the medial temporal lobe, so when epilepsy involves partial seizures, it is often referred to as temporal-lobe epilepsy. It is the most common form of epilepsy in adults. In patients with recurring temporal-lobe seizures that are poorly controlled by antiepileptic drugs, neurosurgical removal of the epileptic tissue may be necessary. In that case, localizing the onset of the seizure discharge is necessary to guide the neurosurgical procedure. It is critical to determine that the patient’s seizures stem from one temporal lobe, and only that temporal lobe, if the limbic tissue of that lobe is to be removed. 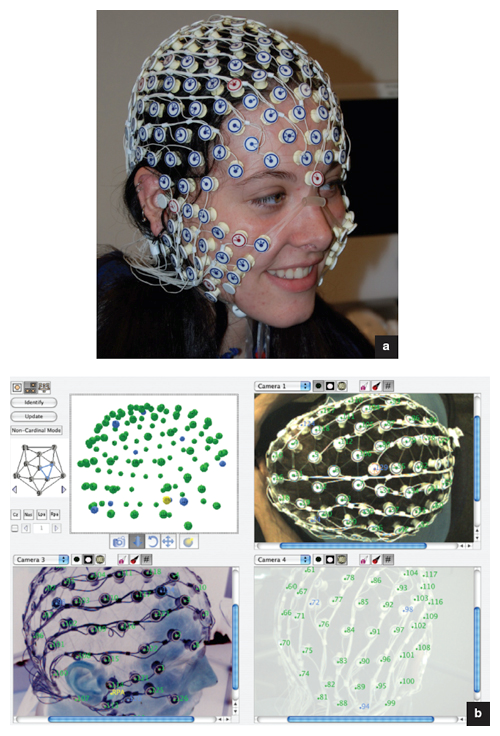 With recent advances in dEEG technology, sampling the brain’s electrical field can be accomplished with electrodes that cover the head fully. With adequate coverage, the electrical measurements can then be registered with a three-dimensional MRI of the person’s head tissues. 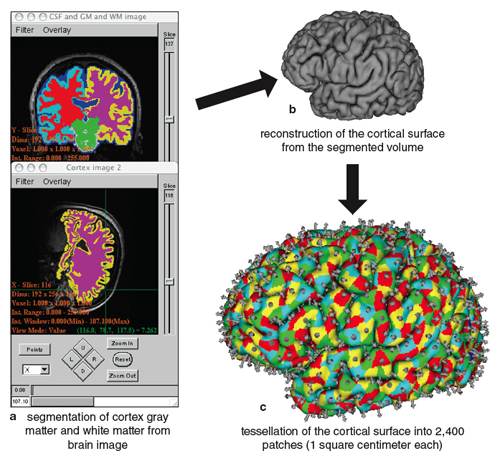 Then computer visualization can extract the cortical surface and build a detailed electrical model of the person’s brain. With this precise electrical model and dense-array measurement, the onset of seizure activity can be estimated from the noninvasive dEEG at the head surface. Validation studies with intracranial electrodes, placed directly on the brain surface, have provided evidence that the dEEG estimate of seizure onset is sufficiently accurate to guide neurosurgery. Clinically, epileptologists and neurosurgeons have considerable evidence showing that when seizures appear to begin in the temporal lobe, they are starting in the limbic networks of the medial temporal lobe. To understand why limbic networks tend to generate seizures, researchers have conducted experimental studies of induced seizures in animals. This research has suggested that the reactivity of limbic networks in epilepsy reflects the high level of electrophysiological, and perhaps functional, excitability of limbic tissue. The limbic networks are in a good position to be reactive to events anywhere in the hemisphere because they are centrally located. The last several decades of neuroscience research have yielded important insights into the connectional architecture of the cerebral hemispheres, and a key finding has been the central role of limbic networks. Research by Deepak Pandya and his colleagues at Boston University has introduced quantitative methods to studying the connectivity of the primate cortex. In the earlier qualitative studies, any neural connection between one area of cortex and another was sufficient to consider them connected, leading to complex, rather indiscriminate maps that implied that most areas of cortex were interconnected to each other. Instead, the quantitative studies showed that the primary paths of neural connections link the sensory and motor cortices with their bases in limbic cortex. Moreover, the density of interregional connections (for example, connecting auditory with visual association areas) becomes greater closer to the limbic system. The implication of this connectional anatomy is that the limbic regions are the primary integrative networks of the hemisphere, whether for sensory integration in the posterior brain or for motor organization in the anterior brain. The architecture implied by this evidence is remarkable. It shows how the classic “association” areas of the cortex are actually intermediate, falling between primary sensory or motor areas and their limbic base. This architecture can also help explain why seizures tend to engage limbic regions: These regions are at the core of the hemisphere’s connectivity. The functional significance of the hemisphere’s connectional architecture is clearly illustrated by the role of corticolimbic interaction in forming memories. This activity results from the interaction between the neocortical networks, for example, those handling sensory or motor functions, and the limbic networks at the core of the hemisphere. Evidence from both human clinical studies and animal experiments has shown that if the connections between neocortex (for example, auditory cortex) and limbic cortex are severed, the relevant memories (for example, memories of sounds) cannot be formed. Previous memories may be recalled (depending on the severity of the brain lesion), but new ones cannot be created. This evidence has two important implications. First, memories are not localized in one spot in the hemisphere but are distributed across multiple networks, including limbic, association cortex and primary (for example, auditory) cortex. Second, in order to form a memory, some physiological process, often called consolidation, is necessary to allow the perception of an event to engage responses in limbic cortex. These responses then feed back (in some way not yet understood) to energize the memory trace, which is not discretely localized but, rather, distributed across the linked corticolimbic networks. The limbic networks, linked closely to the body’s homeostatic, visceral regulatory mechanisms in the hypothalamus, are responsible for motivational control. Considering this, a reasonable hypothesis is that the functional role of limbic networks in memory consolidation is to regulate the memory process to ensure that motivationally significant experiences are provided with adequate consolidation to be retained in memory. Remarkably, the same excitability of limbic circuits that causes them to resonate to motivationally significant experiences may lead them to be seizure-prone. We have seen that human epilepsy often involves the temporal-limbic networks; some researchers have hypothesized that the recurrent seizures of epilepsy may progress toward temporal involvement wherever they originate in the cortex. In a phenomenon called kindling, seizure discharges in experimental animals are first started in an area of neocortex through repetitive electrical stimulation. The first stimulation causes only a direct local discharge, but subsequent stimulations cause a kindling or exaggeration of the response, leading to continuing, seizurelike discharges. The researchers using this method soon found that wherever the kindling was started, the seizure discharges tended to progress to the limbic core of the hemisphere. The close association between kindling and learning was discovered in an experiment a number of years ago by the team of Jerri Janowsky at Oregon Health Sciences University. The team found that seizures, once kindled in an animal’s brain, could be conditioned or learned through association with a sensory stimulus, such as a sound. The limbic resonance that recruits the electrophysiological excitement of a seizure appears similar if not identical to that which recruits the consolidation of a significant event in memory. If limbic seizures impinge on the anatomy of memory, what happens to a person’s memory after a seizure? Typically, the person shows retrograde amnesia, meaning the loss of memory extends gradually back in time for minutes or even hours before the seizure. Because of this recent memory loss, the person is disoriented and unable to act coherently. The person has no ongoing memory of his or her location or what has been happening. This is a clue to the normal coherence of consciousness in time. Given the critical role of temporal and limbic networks in memory, seizures that affect these networks most strongly may be expected to cause severe impairment of recent memory. Observations by Dan Drane of the University of Washington’s Regional Epilepsy Center have suggested that temporal-lobe seizures may indeed affect recent memory more than other seizure types. We think that the disorder of recent memory that accompanies limbic seizures provides an important clue to the neurophysiology of a key aspect of consciousness: ongoing memory. Without the continuity of recent memory, and the associated ability to anticipate the immediate future, the temporal span of consciousness becomes vanishingly thin. Imagine that you have no memory of what happened one second ago. Are you still conscious? Certainly you are conscious of this one second, and you could argue that immediate consciousness is preserved. Yet even a moment’s reflection makes it clear that there must be some historical scope of awareness—and without it, functional consciousness retracts toward a complete loss of meaning. Recognizing that limbic memory mechanisms are the basis of the frontal lobe’s ability to plan for future actions, the late Swedish neuroscientist David Ingvar described planning as “memories of the future.” Similarly, acknowledging the limbic base of the cerebral hemisphere’s functional architecture, American biologist Gerard Edelman described consciousness as “the remembered present.” Considering how normal consciousness requires both the context of recent memory and the projection of events into the unfolding future, we suggest that ongoing memory is an essential component of human consciousness. As shown by various disorders of consciousness, including not only limbic seizures but delirium and dementia, the loss of ongoing memory is devastating for the conscious control of cognition. As recent memory shrinks, so does conscious anticipation of the future. Ongoing memory allows us to orient to person, place and time. In normal consciousness, we continually project the active residuals of immediate history into the unfolding future, thereby maintaining the temporal continuity of mind. Careful analysis of the effects of limbic seizures thus provides a novel insight into neuropsychological activity that binds the mechanisms of consciousness in time. This insight can be refined further by contrasting limbic seizures with a disorder of consciousness caused by a kind of seizure that specifically does not impair ongoing memory. 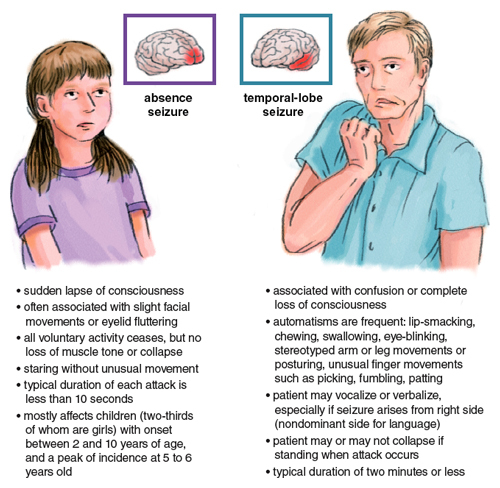 Although they may continue into adulthood, absence seizures typically affect children. There is a momentary disruption of consciousness, during which the person is unresponsive and unable to carry out voluntary actions. However, unlike the loss of consciousness from any other neural disruption—such as fainting, drug toxicity or concussion—the person does not fall down, appears to be alert and does not become disoriented. During the seizure, the brain emits large spike-wave discharges that suggest a generalized seizure. However, immediately after this typically brief seizure, the person may continue the previous activity or pick up the conversation where it left off, showing that he or she remains fully oriented in time. The absence spell is thus a remarkably specific lesion, or disruption, of consciousness, and it is particularly remarkable in what it does not cause: disruption of ongoing memory. Consistent with this specific psychological effect, the anatomy of absence epilepsy provides clues to a specific circuitry of the thalamus and frontal lobe. The implication is that this neural circuitry must be integral to the voluntary control of thought and action in the normal brain. Several lines of evidence suggest that abnormal discharges from the thalamus figure in the development of spike-wave seizures in animals, and in similar discharges in absence epilepsy. 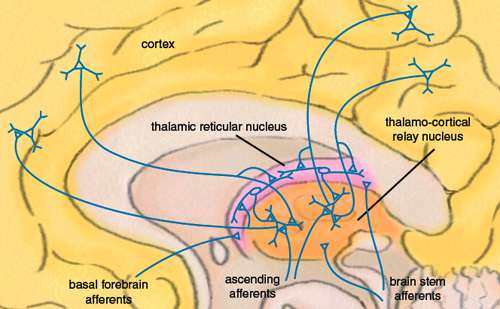 The thalamus can be described as the gateway to the cerebral cortex, binding the networks for specific mental functions. With the exception of the sense of smell, all sensory and motor pathways enter or exit the cortex through thalamic relays, and the thalamus is capable of blocking transmission in these relays. A unique feature of the thalamus, the thalamic reticular nucleus (TRN), is a thin sheet of neurons surrounding most of the thalamus. This network provides direct inhibitory control over the thalamocortical relays. Importantly, as another example of the complexity of the brain’s self-regulatory systems, the TRN is itself under cortical control, from specific networks in orbital and frontopolar cortex. This evidence of a localized, frontal-lobe control network for regulating thalamic mechanisms has proven important in interpreting localized seizure activity in absence spells. In our dEEG studies of the pathological discharges during these spells, we found that, even though these discharges were thought to cover large areas, the spikes are highly localized. Indeed, they are specifically localized to the orbital and frontopolar networks of the frontal lobe, which are in turn critical to regulating the thalamus. The implication of this new evidence is that the seizure discharge reflects some abnormality in the physiological activity in the frontal networks that then cascades in a pathological loop through the frontothalamic circuitry. The cortical discharge appears to affect the TRN and thalamus, and thereby disrupts the thalamic control of the cortex itself, perhaps leading to the next cascade of spike-wave discharge. Does this evidence of pathological function provide clues to the normal, adaptive functions of the frontothalamic circuitry? The evidence is complex, because it suggests even greater specificity in separating the circuits controlling attention (the application of mental resources to certain events or topics) from intention (the current goal of mental activity). The specificity of the frontal lobe’s control over thalamocortical mechanisms of attention has been demonstrated by recent anatomical evidence gathered by Basilis Zikopoulos and Helen Barbas at Boston University. These data show how specific networks in the frontal lobe project to specific regions of the TRN, and thereby to specific thalamic nuclei. The relevance to controlling attention is shown by the pathways from certain frontal networks (on the lateral surface) that project to the regions of the TRN that control the specific sensory nuclei of the thalamus. These circuits are well suited to controlling the “spotlight” of attention by allowing the thalamus to highlight certain sensory data while pushing other input to the background. Importantly, however, the seizure discharges during an absence spell do not seem to engage the frontal networks that regulate the spotlight of attention. Rather, in our dEEG studies we found that the spikes of spike-wave absence discharges engage the medial frontal poles; these are the networks that Zikopolous and Barbas found to be connected to the rostral pole of the TRN, which in turn projects to the anterior nuclei of the thalamus, also called the limbic thalamus. This frontothalamic circuit, rather than controlling the spotlight, appears to integrate limbic contributions to the state of arousal and motivation. One interesting line of animal research suggests that activity in this circuit is related to the animal’s head orientation, apparently tracking the self-centered locus of the animal’s current intentions. Considering this specific functional circuitry in the seizures that cause absence spells, we think that the loss of conscious control of behavior in this disorder reflects an impairment of a frontothalamic circuit that is integral to the voluntary control of intention. This is not the selective attention to one sensory focus, but the maintenance of the alert intentional state that allows cognition and behavior to pursue a motivated goal. Absence seizures thus disrupt a specific component of consciousness, the person’s current intention that then binds multiple other component mental operations within a coherent, goal-oriented episode of experience. Even as voluntary intention is disrupted in the absence spell, ongoing memory remains relatively intact. This implies a fractionation of consciousness by different seizure types. Limbic seizures impair ongoing memory over a considerable interval of time, so that even as consciousness is regained it is incomplete and disoriented. Absence seizures create a more focal disruption of consciousness, impairing voluntary intentional action but not degrading the continuity of ongoing memory. With ongoing memory more or less intact, the person retains the subjective orientation to the immediate experiential context, and can therefore pick up the conversation where it left off. By fractionating consciousness in a specific way, absence seizures show the specificity of both what is lost (voluntary intention) and what is retained (ongoing memory and orientation). The unique fractures in consciousness that occur in seizure disorders may offer clues to the underlying mechanisms that bind consciousness within the large-scale networks of the cortex. Ongoing awareness of the context appears to require the operation of corticolimbic networks. Interestingly, this contextual awareness is needed to meet the clinical test of mental competence. To provide a quick assessment of impaired consciousness when a patient appears confused, physicians and psychologists use the test of “orientation times three.” This tests orientation to person (“What is your name?”), place (“Can you tell me where you are?”) and time (“What is the date today?” “What month is it?” “Do you know who the U.S. President is now?”). Consciousness may be clouded temporarily by delirium or disorganized permanently by dementia. In contrast, volitional control of consciousness seems to require frontothalamic circuits, both for the selection of focused processing, such as in selective attention, and for the regulation of the more general state of purposeful intention, which is impaired during the absence spell. Thus both corticolimbic and frontothalamic mechanisms appear necessary for normal consciousness. They seem to bind patterns of physiological coherence within cerebral networks. And certainly this is only part of the story of the brain’s physiological assemblies: These patterns of network coherence must be organized within the general pattern of vertical integration, drawing on support from brain stem projection systems that regulate cerebral arousal. It probably makes sense to most people to consider consciousness as a unitary phenomenon, an indivisible quality of subjectivity. Yet the fracturing of consciousness in absence seizures is particularly impressive evidence for the hypothesis that some aspects of explicit voluntary control, mediated by frontothalamic circuits, can be separated from the continuity of ongoing memory. When we employ reasoning from anatomy and the specificity of absence discharges, even finer distinctions can be made, implying that the selection of the focus or spotlight of attention is separable from the voluntary control of the intentional state itself. Now that we can separate them through neurophysiological analysis, can we recognize these components of consciousness in subjective experience? From a clinical perspective, understanding the specific neural mechanisms of seizure patterns may lead to better diagnosis and more focused therapies, whether drug-based or surgical. If we succeed in understanding the fractures in consciousness caused by specific seizures, then we may also gain a better appreciation of the psychological challenges faced by our patients with seizure disorders. From a scientific perspective, separating specific neurophysiological components of consciousness is necessary to clarify the psychological functions of the neural mechanisms that regulate the brain’s large-scale networks. And from a philosophical perspective, we may find an opportunity to differentiate consciousness into functional components, rather than assuming it is an indivisible quality of mind. But perhaps the most important opportunity is the interdisciplinary one: We are working toward a scientific phenomenology in which an objective, biological analysis leads us toward a clearer appreciation of the bindings of consciousness in personal experience. Holmes, M. D., M. Brown and D. M. Tucker. 2004. Are “generalized” seizures truly generalized? Evidence of localized mesial frontal and frontopolar discharges in absence. Epilepsia 45(12):1568–1579. Tononi, G., and C. Koch. 2008. The neural correlates of consciousness: an update. Annals of the New York Academy of Science1124:239–261. Tucker, D. M., M. Brown, P. Luu and M. D. Holmes. 2007. Discharges in ventromedial frontal cortex during absence spells. 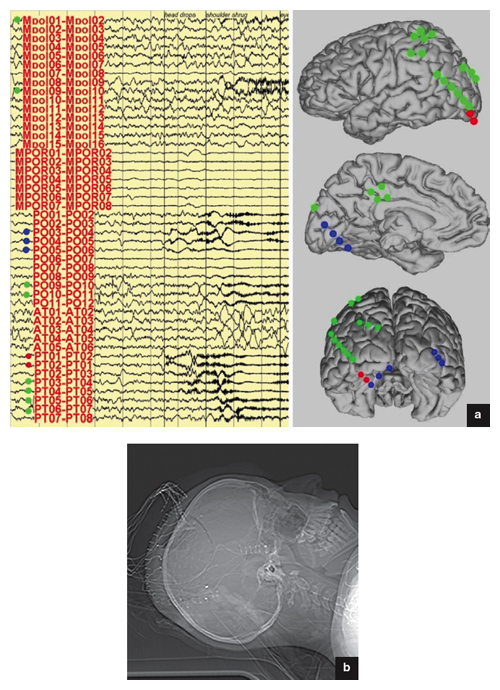 Epilepsy and Behavior 11:546–557. Tucker, D. M. 2007. Mind From Body: Experience From Neural Structure. New York: Oxford University Press.